Written by CMOS Bulletin SCMO on April 4, 2018 . Posted in News & Events, Other. On March 7th 2018 Dr. Philip E. Merilees passed away peacefully, surrounded by loving family in the hospital near his home in Bonita Springs, Florida, following a short battle with cancer and its complications. Dr. Merilees was an exceptional scientist and scientific leader in both Canada and the USA. He was a brilliant theoretician who made many contributions to our understanding of atmospheric and oceanic fluid dynamics. He was a gifted teacher, supervisor and mentor of students who became an exceptional manager of research and of researchers. He will be sorely missed by a wide circle of colleagues, students and researchers whom he supervised and by all those whose lives he touched. Phil, as he was known to nearly everyone, was born in Chatham Ontario and grew up and received his early education there and in Montreal. He obtained a BSc in Physics in 1960 from Sir George Williams, now a part of Concordia University, and an MSc in Physics 1962 from Carleton University in Ottawa. He joined the Meteorological Service of Canada (MSC) and studied Meteorology at McGill University, receiving a PhD in 1966. Phil was a true mathematical physicist who combined physical insight with the mathematical skill to describe atmospheric and oceanic fluid dynamical and thermodynamic processes mathematically and to manipulate the equations in order to provide new physical insights. He could have become a leading contributor to more fashionable fields like particle physics, which he eschewed because of the runaway proliferation (in his view) of particle types. Instead he became fascinated by geophysical fluid dynamics and the many problems of understanding the development of structured flow patterns that arise from the chaotic patterns of random turbulence, as exemplified by the so-called dishpan experiments. As a working researcher and academic he published more than fifty papers in these and other fields. Many of these papers attracted international attention. 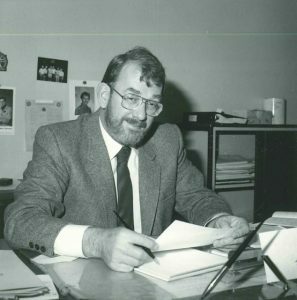 His work led to his appointment to numerous international bodies and to recognition of his personal contributions to research and research management. He represented Canada on the Intergovernmental Panel for the Global Atmospheric Research Program, the Medium- and Large-scale Dynamics Working Group of the International Association of Meteorology and Atmospheric Physics and the Commission for Atmospheric Science of WMO. He chaired Grant Review Committees for the National Science and Engineering Research Council of Canada and for the National Science Foundation in the USA. He won a WMO Research Award in 1970 and the President’s Prize of CMOS in 1978. He was made a Fellow of the AMS in 1981 and a Life Member of CMOS in 1987. He was awarded the Patterson Medal of the Atmospheric Environment Service in 1994 for his many contributions to meteorology in Canada. Left: Phil Merilees announced as CMOS Fellow, 1999. Presentation took place in 2000 at the CMOS Congress in Victoria. Right: Phil Merilees with other CMOS Past Presidents photographed together during the 2004 Congress at Edmonton. From left to right: Hal Ritchie, Allyn Clarke, Ron Stewart, Peter Taylor, Ian Rutherford, Gordon McBean, Ed Lozowski, David Krauel, Phil Merilees. Phil made many, many contributions to the Canadian Meteorological Society (CMS before 1977) and the Canadian Meteorological and Oceanographic Society (CMOS after 1977): Chair Montreal Centre 1986-1989; Executive Committee 1974-1979; President 1975-1976; Scientific Committee 2000-2018; Co-editor Atmosphere-Ocean 1983-1986; Awards Committee 1983-1986; Publications Committee 1983-1986; Fellow 1999. It was indeed largely due to Phil’s urging that physical oceanographers were invited to join the CMS and the name of the Society was changed in 1977 during his tenure as Past-President. The journal Atmosphere became Atmosphere-Ocean at the same time. Well after retirement Phil continued to serve the community as a member of the NSERC grant selection committee and the CMOS Scientific Committee. In summary, Phil was a warm and wonderful, supremely ethical and honest, person who was dedicated to science, family and friends. My life was enriched to have known him as a friend and colleague. More on Philip Merilees’ life and contributions in the full tribute article by Ian Rutherford that will be available in Bulletin Vol. 46, No. 2.